It's never easy to make sense of the loss of a beloved parent or grandparent. But when children and grandchildren are searching for a heartfelt expression of sympathy for someone who meant the world to them, this lavender and white satin heart pillow is a touching choice. Our expert florists take a heart-shaped pillow and artistically adorn it with a spray of white and lavender blooms for a beautiful final tribute. 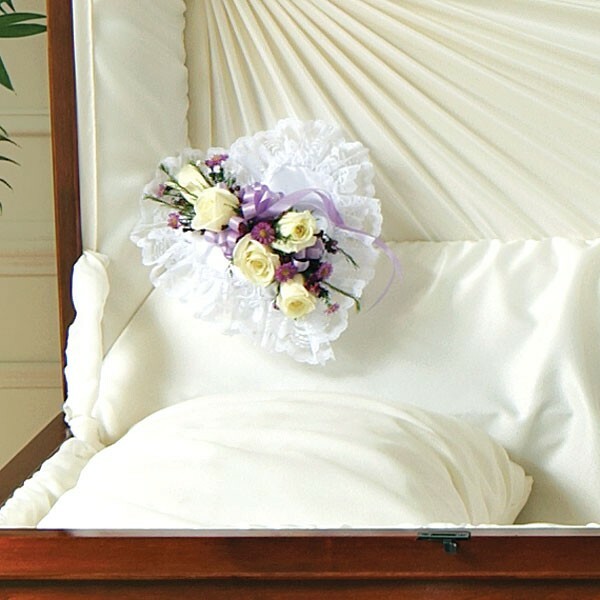 Satin casket pillow, in the shape of a heart, is adorned with a spray of white roses, lavender Monte Casino, purple waxflower and a satin ribbon. Sympathy and funeral flower arrangements from Plantshed.com, your local NYC florist.